FULL TIMEThe Bulldogs come to Cairns and run all over the 'Ablettless' Suns who seemed rudderless despite the importance of this match in the run to the finals, the Doggies were simply too good! GOAL SUNSDixon kicked the first goal of the night and he kicks the last of the night as well as he kicks his third of the match after the siren sounds, to see the Dogs' win by 28 points. BEHIND SUNSShaw makes an attempted snap, the ball is high and wide for yet another minor score. They look whipped, there is no run left in them. BEHIND SUNSLynch with an attempt from outside the arc, his shot is offline for a behind. The Bulldogs are just biding their time now as they share the ball around, the Suns have just looked a little impotent through the middle of the ground and are well down on their usual stats. The Suns are going to have to take a long hard look at this game, without Ablett they have looked a shell of the team that beat the Pies last week. BEHIND BULLDOGSAnother quick kick into the goal square is thumped through by the Suns who look shattered. 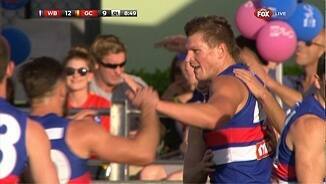 GOAL BULLDOGSFrom a stoppage the ball is thrown out to Liberatore who kicks the ball around his body and scores the goal, it is party time for the Doggies in Cairns! GOAL BULLDOGSDalhaus with a free for in the back, however Hrovat swoops on the ball and the Umpire blows advantage and Hrovat kicks the goal...the Dogs are home! GOAL BULLDOGSBontempelli with a run through 50, he can hear the defence closing and so puts the kick out in front of Stringer who turns his man inside out and kicks the goal over his shoulder. BEHIND BULLDOGSThe Suns' thump through a long rushed behind to put the lead out to 17 points, it is still under three kicks but only just. Bulldogs InterchangeMark Austin off due to the blood rule. GOAL BULLDOGSDalhaus with quick hands slips the ball out to Macrae who is running away from goal, he turns on a tight arc and from 45 out slots a lovely goal, his second for the term. The Suns just cannot get out of their defensive half, the Bulldogs are simply too desperate and the Suns' usual pin point disposal has been eluding them all night. GOAL BULLDOGSMacrae who has had the ball on a string all nigh is somehow left all alone 45 out and of course the ball finds him, he guides his kick home to put the Dogs' 10 points up. BEHIND BULLDOGSHoneychurch with a very soft free kick for in the back sprays his kick wide for a behind, the Suns will think that that is a just reward. Suns InterchangeKade Kolodjashnij and is possibly out for the game. Bulldogs InterchangeLachie Hunter off due to the blood rule. Suns InterchangeZac Smith off due to the blood rule. 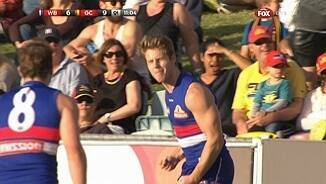 Welcome to Cazaly's Stadium for the Western Bulldogs v Gold Coast Suns Round 17 clash. 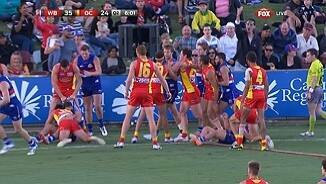 A STATEMENT needed to be made, but instead Gold Coast only raised more questions over its finals credentials without injured skipper Gary Ablett. The battling Western Bulldogs kicked six unanswered goals in the final term to score a comfortable 13.16 (94) to 9.12 (66) win over the Suns in Cairns on Saturday. Dual Brownlow medallist Ablett was ruled out for the rest of the season this week after undergoing a shoulder reconstruction with his side clutching onto eighth spot. The loss leaves the Suns' finals hopes hanging by a thread and if Essendon beats Collingwood on Sunday, they will be bounced out of the top eight. It was also the sixth time the club has lost in six outings without their skipper. 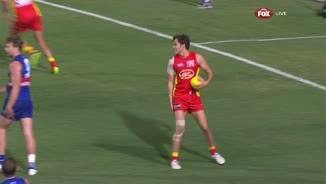 But Gold Coast coach Guy McKenna said it wasn't the absence of Ablett that cost them, it was the lack of intensity shown by the 22 men who took to the field at Cazaly Park. 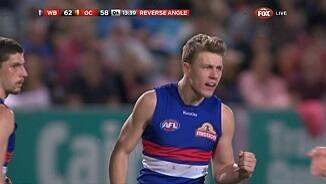 "I don't think we had any spark from the first bounce," he said. 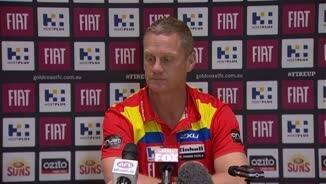 "In the 80-odd times that he (Ablett) has played for our football club, six times this has happened (the Suns have lost without him). "You can throw all the different reasons why, conspiracy theories and all that sort of stuff, we just didn't win our one-on-ones." Emerging midfielder Jack Macrae was the catalyst for the Bulldogs' win, the 19-year-old kicking two goals in a final term blitz. 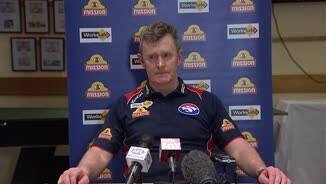 His performance came a week after Bulldogs coach Brendan McCartney had dumped him to the substitute bench and said the teenager had been "letting us down in some areas". "His strengths came out in buckets tonight," McCartney said. "I saw a batch of senior experienced players coordinate the team and just drive a standard and a way of doing things and some really exciting young players work their way through a game. "Play the roles they were asked to do and then their talent came out at the end when the game broke open." 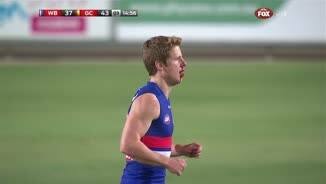 The Bulldogs had threatened to blow the game wide open in the first quarter, slamming home three majors in four minutes after the wasteful Suns missed three golden opportunities on goal. The Suns needed something to stop the rot and they found it in Jaeger O'Meara (two goals, 22 disposals) in the shadows of half-time with the 20-year-old loading up from 50m out and kicking a goal. Charlie Dixon slotted another major for the Suns to open the second quarter, but for the next 20 minutes the two teams traded behinds before finally Tom Lynch (two goals, 16 disposals) broke the goal drought. His superb individual effort closed the gap to just five points. 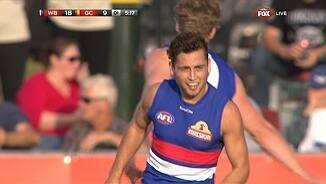 The tense battle continued in the third term before the Dogs eased to victory with the match in the balance.